If you are running encoded files on Mac, Linux or FreeBSD under Ruby 2.3, please update the loader. It's not necessary to re-encode the files, only update loaders. We fixed the issues with global variables for Ruby 2.3 and the above platforms. Windows (MinGW) loaders were not affected. Encoder: fixed the problem with encoded files detection containing a shell prefix #! 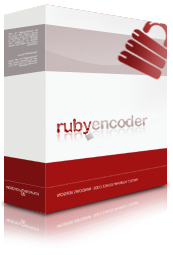 The update of the encoder is recommended to users running Windows Vista. The update of loaders is recommended to users running Ruby 1.9.1. Note: It is possible to encode and deploy rails configuration files usually stored in /config folder. You cannot encode *.yml database configuration script as it's not a ruby script. We suggest to use a cipher to encrypt this and load and decrypt it from the RubyEncoder protected code. So you will keep the key safe within the RubyProtected script. Also you cannot have encoded /config/environments/*.rb scripts. Leave them unencoded. The reason for it is Rails internals. Rails loads the environment file dynamically and evaluates it with eval(). This will not work for protected scripts.